Home design is, firstly, all about how the user operates their space on a daily basis. Secondly, home design is all about how the user operates their space when they entertain. The home bar has steadily become a standard component found in homes today. Features often found in a home bar include: an under counter fridge for wine and beverages, an ice maker, a small sink, lockable liquor drawers, and visible shelving. Hospitality, especially in the south, is valuable as well as influential. And having a space that caters to this is imperative. Secondary spaces, like the home bar, keeps your kitchen reserved for cooking, while guests can mingle in other areas reserved for drinks and hors d’oeuvres. Home bars don’t have to be very big, and have been known to be retrofitted from closets and even under the stairs. They can always be visible or close off when not in use. They also create more storage for glasses and dishes. We are raising the bar on home standards everyday! A traditional countertop design extends the lip of the countertop just a few inches beyond the edge of the actual counter. 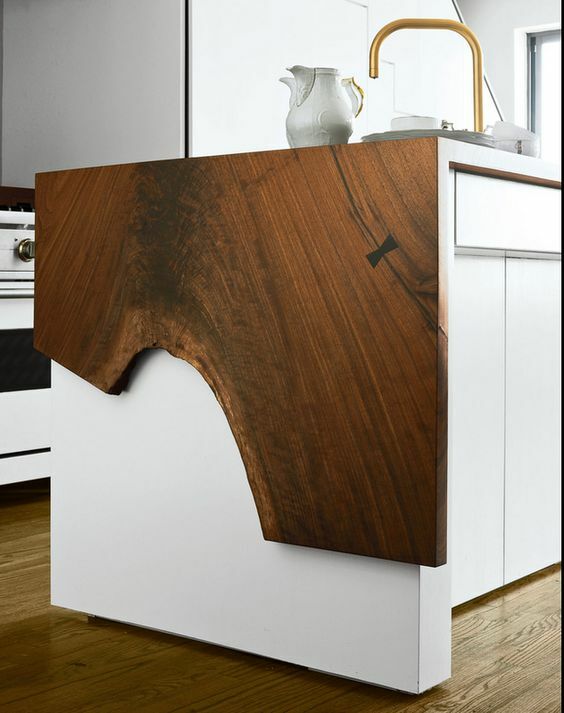 A waterfall countertop continues the past the edge of the counter, vertically down to the floor, extending the material to all sides of the island. 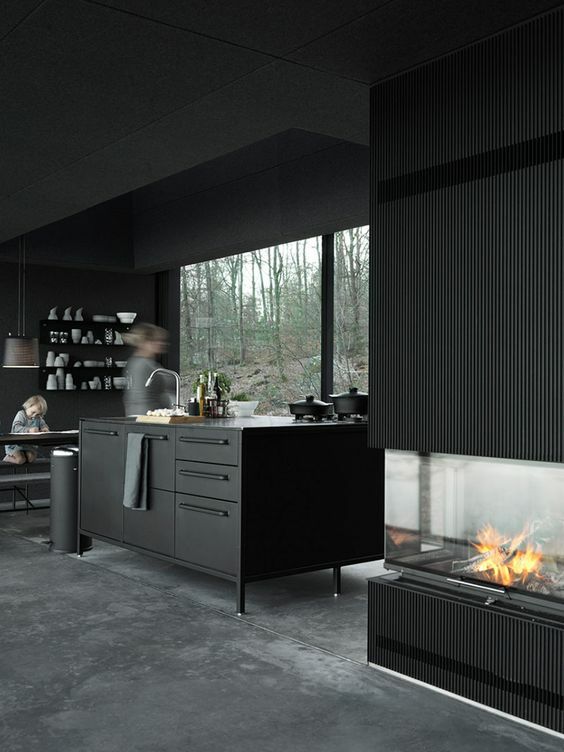 What seemed like a temporary trend at first is becoming a staple in modern kitchens. 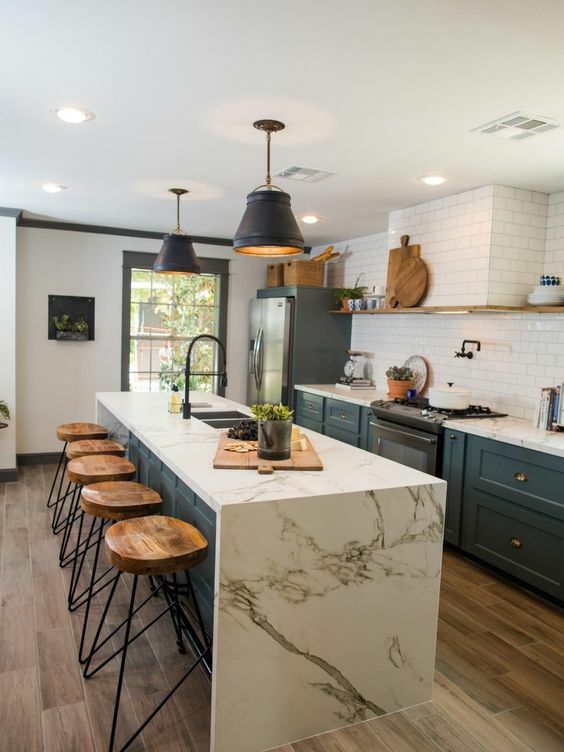 By far the most popular material used is stone, but we are also seeing wood and concrete countertops getting the waterfall treatment. As with most concept and trends, people are finding ways to challenge the classic method. 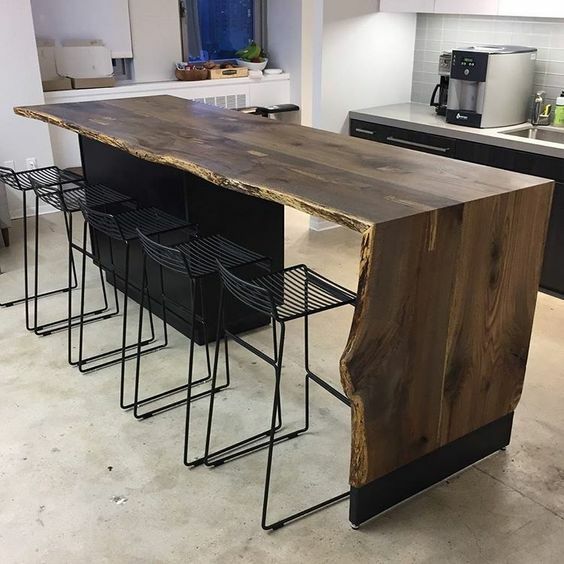 We are seeing partial, offset and live edge waterfalls becoming more common as well. Last month, it was stone. This month, we’re back, taking you through the ins and outs of butcher block countertops. 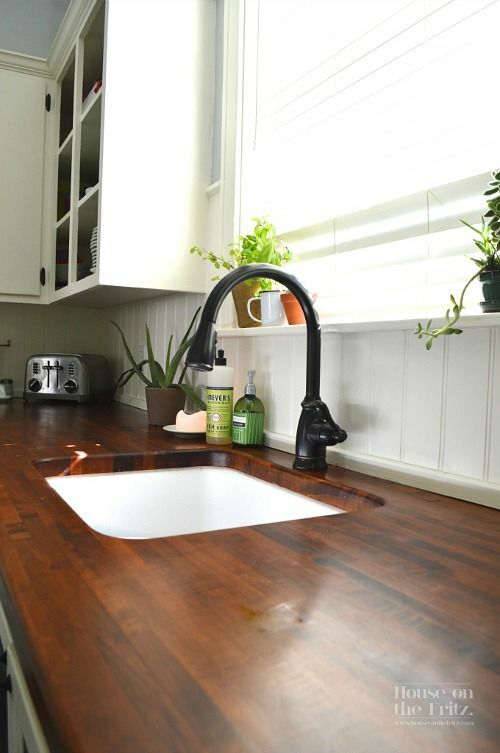 These naturally beautiful wood countertops have a lot going for them: they are eco-friendly, anti-microbial, and even citrus resistant (unlike granite and some stone countertops). It’s easy to see why these countertops are so popular. 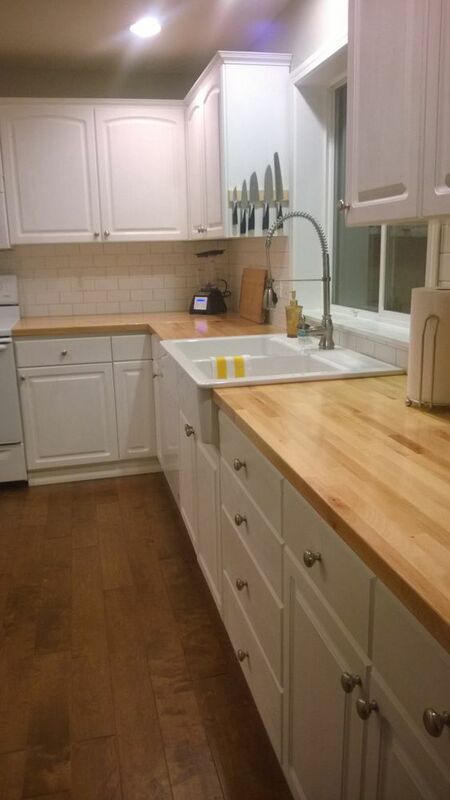 What are Butcher Block Countertops? Butcher block is one of the oldest materials used for countertops. Its use evolved very naturally; kitchen chefs would use thick slabs of wood as for cutting and chopping in their kitchens. Eventually, instead of just having a slab, kitchen designers thought to use long, thick planks of wood as countertop material. Today’s butcher block countertops are made of long, thin pieces of wood fused together. This method gives you, the consumer, more control over the configuration of your countertop, as well as better quality material. You don’t have to follow the natural grain of the wood or include imperfections in your design. The four most popular types of butcher block countertops are made from maple, oak, bamboo, and antique pine. 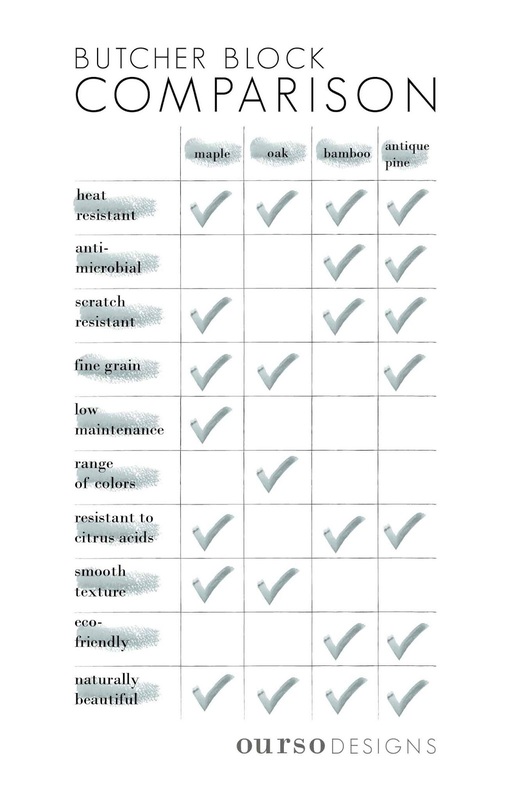 Each type of wood has its own pros and cons. 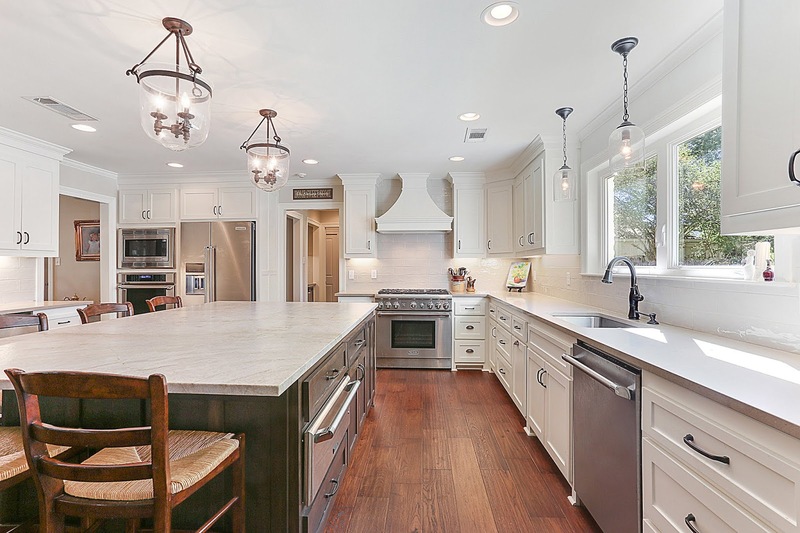 Learning about each will help you make a more informed decision when you are thinking about adding butcher block countertops to your next new build, renovation, or remodeling project. 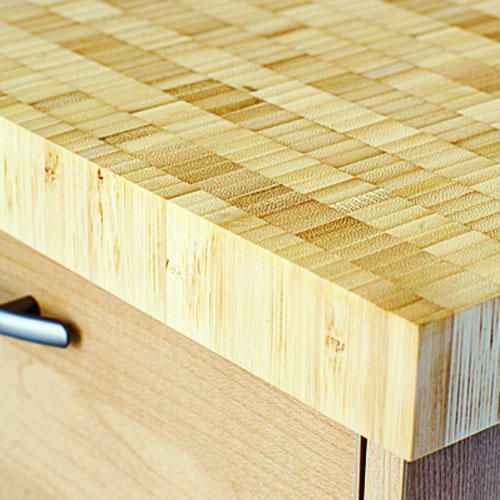 This most popular butcher block material today is maple. This hardwood is a natural choice for a couple of reasons. First, this wood has a simple, straight grain, which gives off an overall appearance of elegance. It also a beautiful blond to light-brown coloration, which goes well with many styles. Staining tends to bring out the spectrum of this wood’s coloration, making it an eye-catcher in any setting. Oak countertops aren’t quite as durable as maple, but they do have their own perks. Oak gives you the greatest range of color variation, thanks to the numerous species of oak that can be used. You can have from rich dark honey tones of a red oak all the way to the subtle corn and hay tones in a white oak. 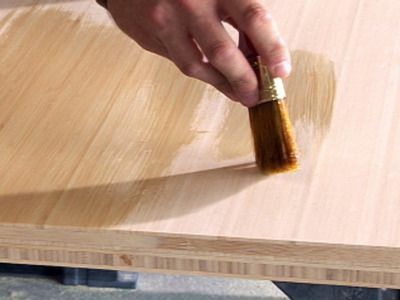 You might have heard that wood countertops are impossible to sanitize. This is a myth. 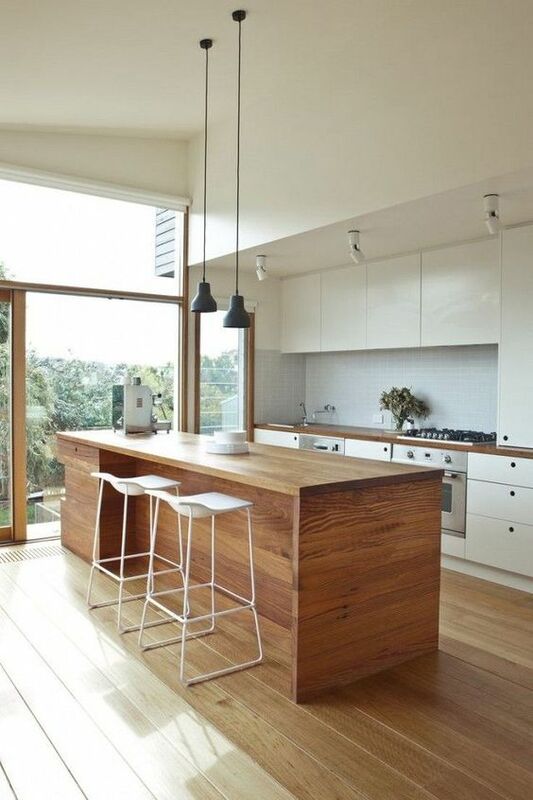 Most wood countertops naturally kill bacteria. Germs like salmonella and listeria need water to grow; wood binds up water, making it difficult for bacteria to grow. Wood consistently outperforms materials like plastic when it comes to controlling the spread of bacteria.And of the wood countertops, bamboo countertops are the most bacteria resistant. Bamboo is also a great choice if you’re looking for an eco-friendly wood option. Bamboo takes only a few years to reach full maturity, making it a sustainable resource. 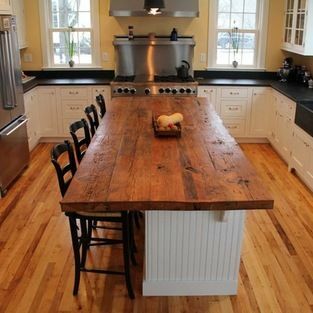 Last but not least are antique pine countertops. These countertops have a unique look, thanks to their 100+ years of maturation. This gives the wood a close-grained texture and a super hard, durable surface. It also makes the wood more stable than young woods. 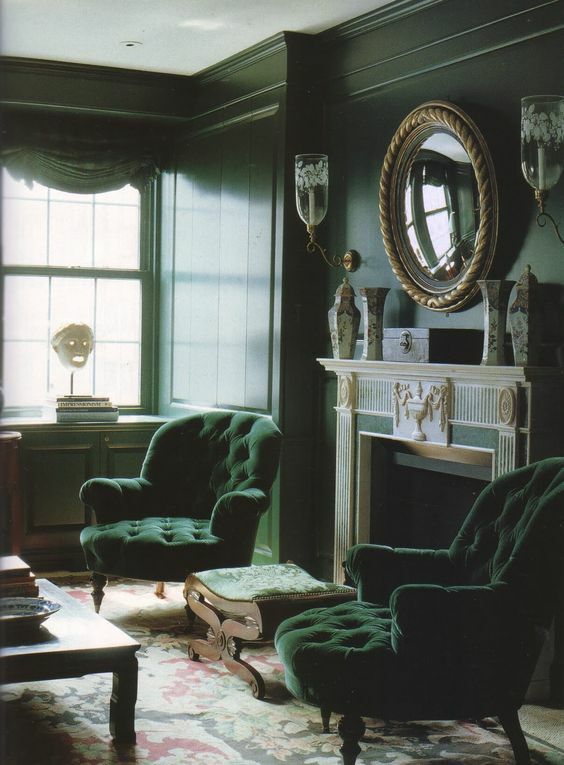 The color will not change over the years as dramatically as with other woods. Antique pine countertops are easy to clean and maintain. Goodbye, 2018. Hello, New Year! With less than a month left in 2018, we thought this would be a great opportunity to look at all that made this year merry and bright. It is, after all, that time of year! Take a look at the best of 2018, and get a sneak peek at what we think will be big in the New Year. What was trendy in 2018, you ask? 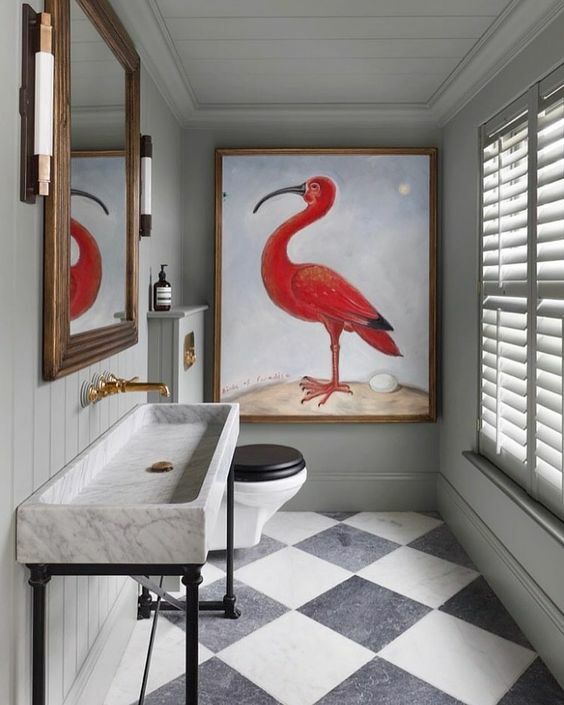 Small pools and ombre interiors, among other things. Click the links to reread this year’s best blog posts. You don’t need to go Olympic-sized to have a great escape from the summer heat. These tiny pools give you relief while working with the size of your yard. Sometimes, you want lots of space. Sometimes, you want to feel cozy. Partition walls help you have the best of both worlds. 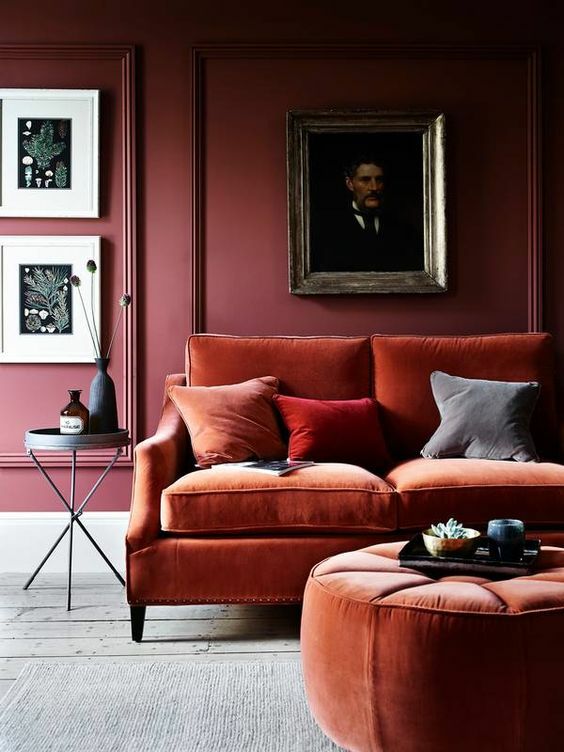 Love them, hate them, ombre interiors made a big splash this year. We’re already looking ahead to 2019. 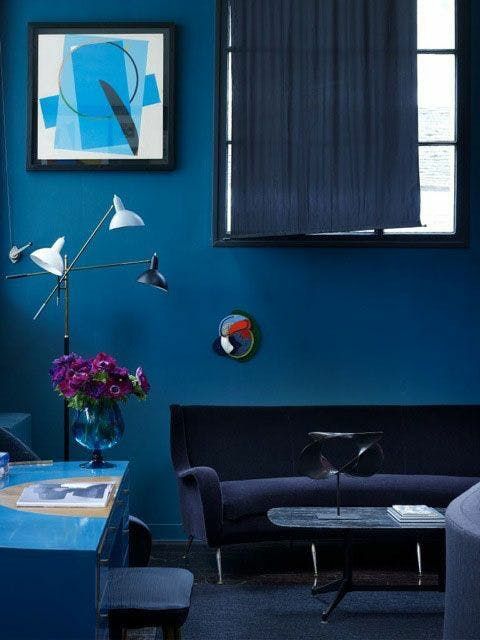 This is what we think will be hot in interior design in the year to come. Last year was all about spice: fiery Caliente and bold Ultra Violet were the top colors. This year, though, major companies are going for a more subdued, sophisticated look in their paint choices. 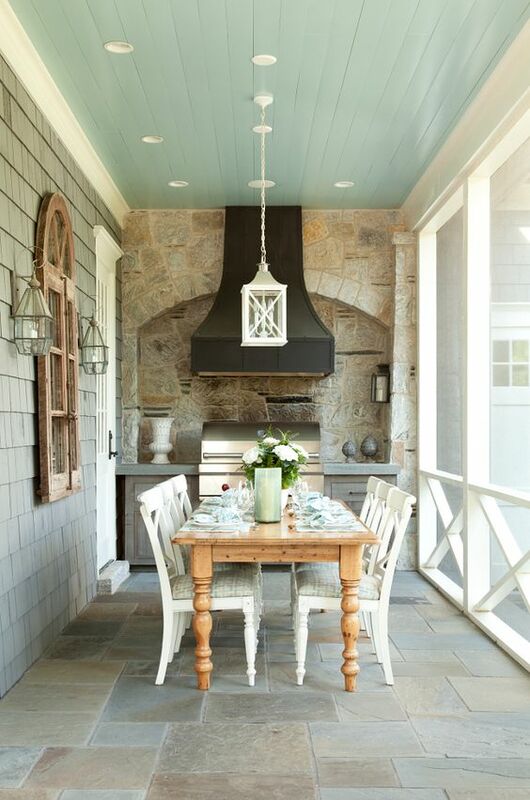 Behr’s top pick for the year is Blueprint S470-5, an approachable cool blue color that compliments pretty much any other color. 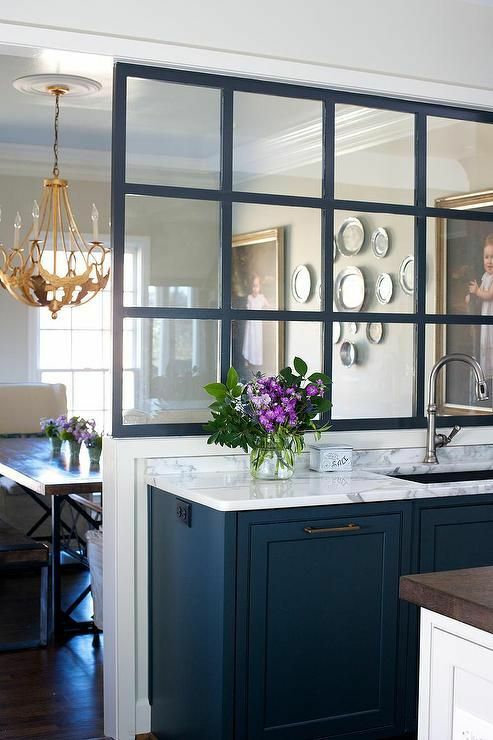 Benjamin Moore went with Metropolitan, a stylish off-white with rich grey tones, reminiscent of Eggshell. 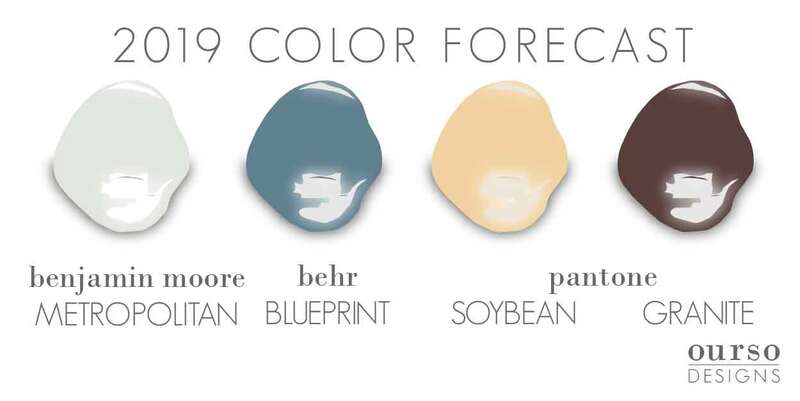 And among Pantone’s picks for the year are Soybean – a subtle, buttery white – and Brown Granite – an earthy grey-brown tone. 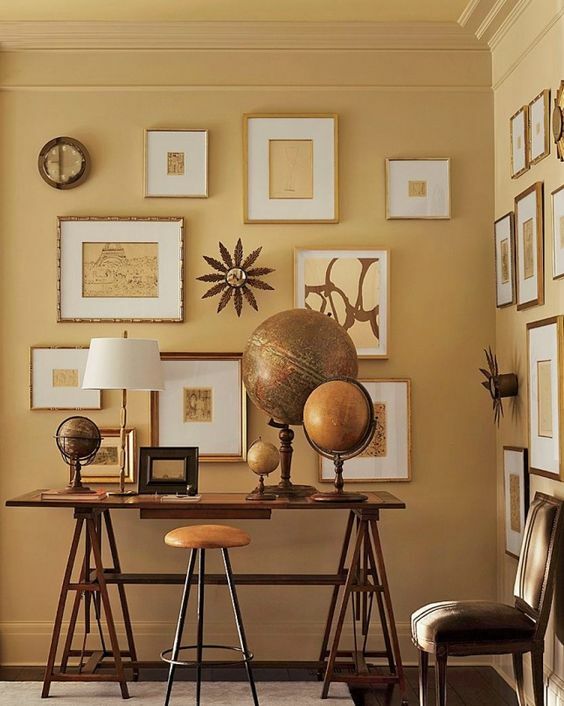 The Verdict: Stick to tried-and-true neutrals for walls, carpets, and ceilings. 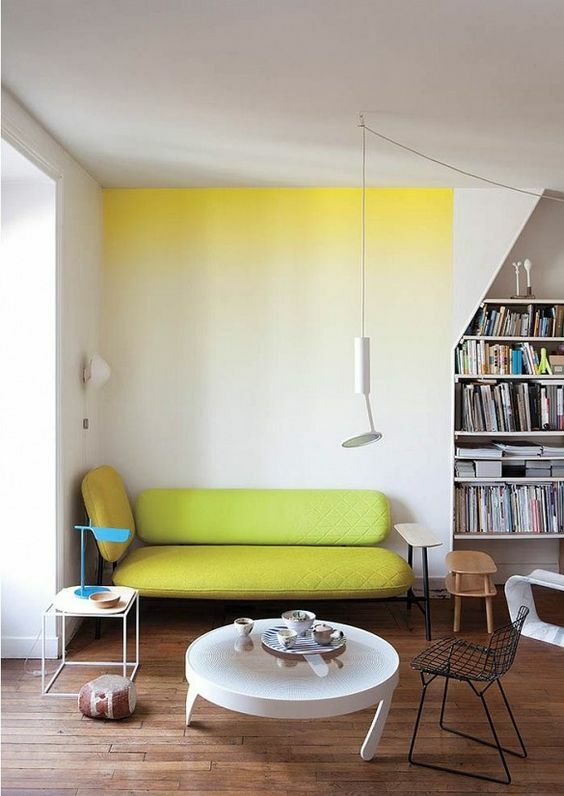 If you’re all about that pop of color, work it in with accessories or furniture. You want you home to feel clean, calm, and modern. For the last several years, mid-century modern has been king. 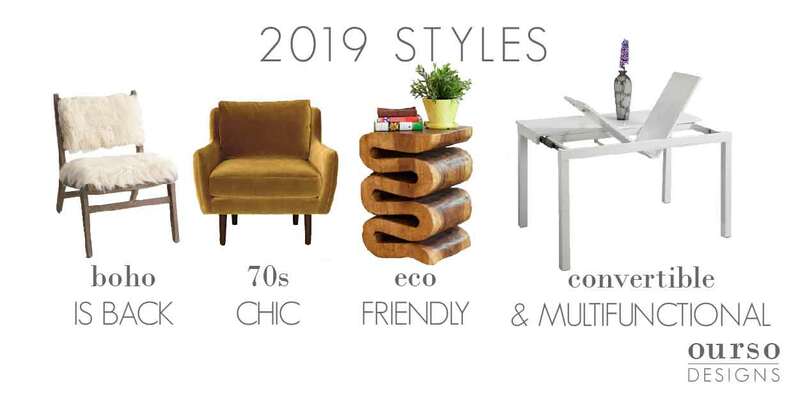 While the clean lines and natural influences of mid-century modern will continue to be important, we think that 2019 will be a little funkier. 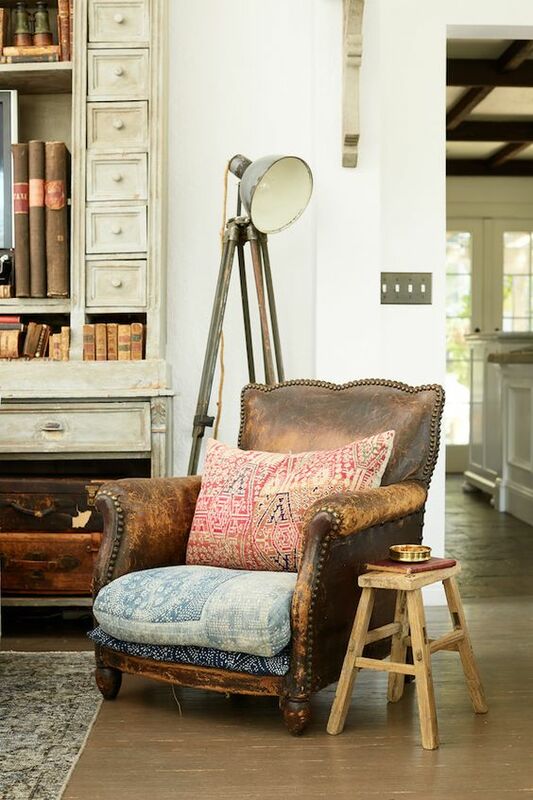 If you take a look at Boho style, you’ll notice a few familiar things: clean lines, natural materials, a blend of form and function. Yes, it is a lot like mid-century modern. Where the two styles differ is in boldness. Boho favors brighter colors, fun patterns, and rich textures. Also, you can’t go Boho without at least one sheepskin piece. Also on the fun side – this new trend of subtle 70s style. Hello, velvet and floral patterns! Lots of manufacturers are looking to make more sustainable products by making changes to their materials, sourcing, and manufacturing processes. We love this eco-friendly trend; what’s good for your design scheme can also be good for the earth. Last but not least, more and more people are looking for their rooms, and furniture, to do double duty. Manufacturers are welcoming these desires by creating pieces that are both beautiful and multifunctional. 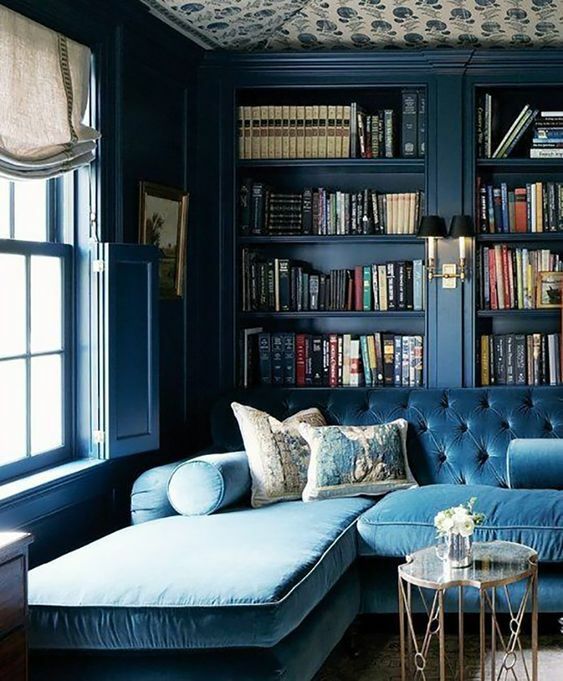 These pieces make the best use of your space; if you’re on the tiny house trend, or if you’re just into downsizing, this trend is for you!Your coffee table doesn’t just have to hold books and drinks; it can also convert to a desk for those nights when you have to take work home. The Verdict: We love mid-century modern, but maybe it is time to leave in the last century. 2019’s biggest accessories will be a mixture of old and new. Old: terrazzo. Yes, that 30s staple is back. 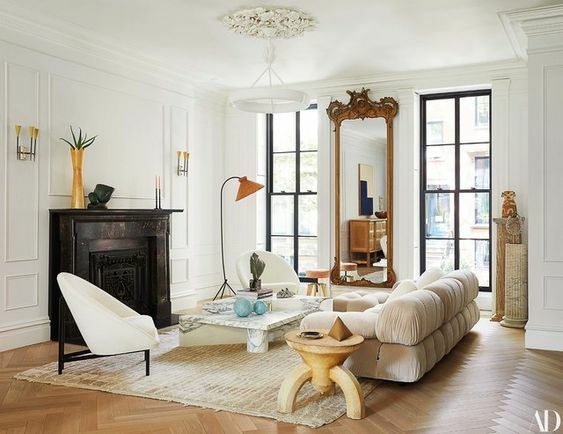 Advances in manufacturing have given buyers a wider selection of looks and finishes, from positively kitschy to on-par-with-granite elegance. 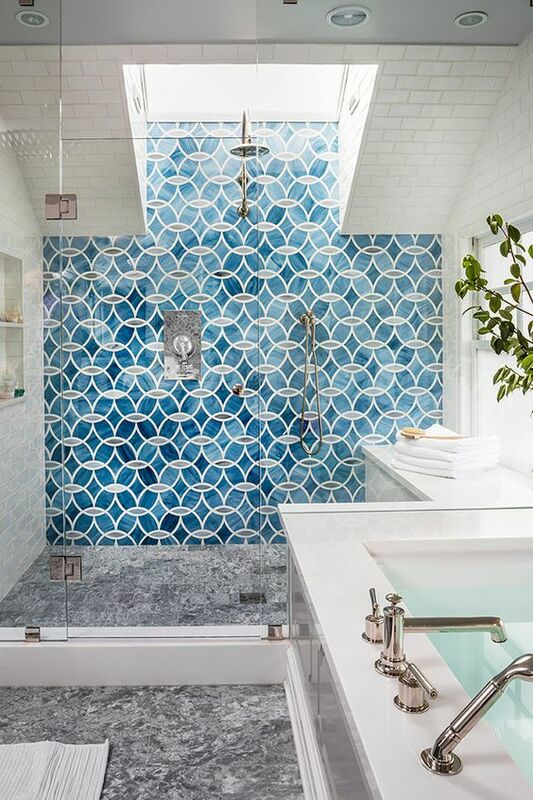 Also, geometric patterns, which have been a staple in the design world for many years, continue to be popular. New: artisanal fixtures. 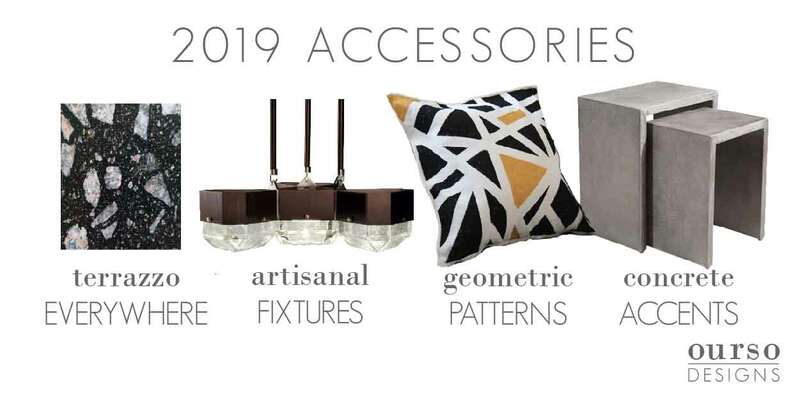 Bold metal accents, blown glass features, and hand made accessories will elevate the look of light fixtures in 2019. The Verdict: Your options may be unlimited, but it is never a bad thing to stick with what you know. What do you think is going to be big in 2019? Share your opinion on our Facebook page. Include the tag #2019forecast. Someone recently told me “Every room needs something black in it;” a rule that, I realized, is an inherent practice that, as a designer, I most always tend to follow. 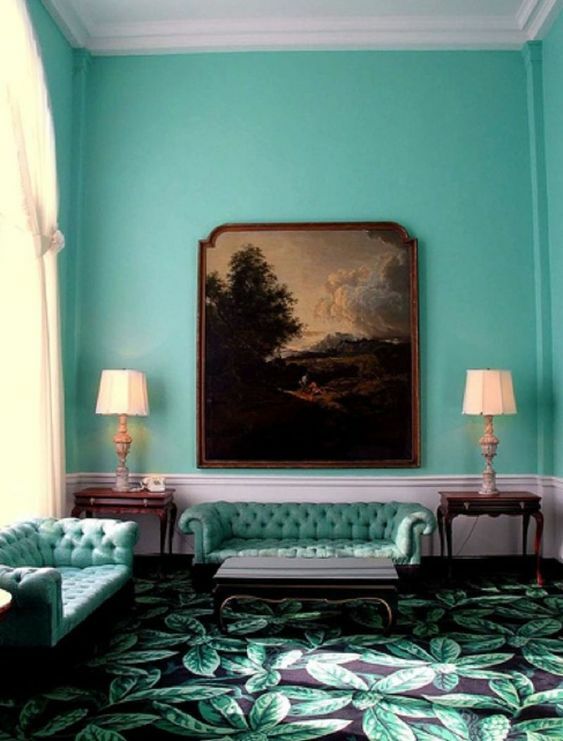 Ultimately, every room needs a bit of contrast. When a palette is becoming too monochromatic, that’s when its time to pull in the black. “Something black” could mean tile, or paint; but it can also come in the form of furniture or decor or even artwork. 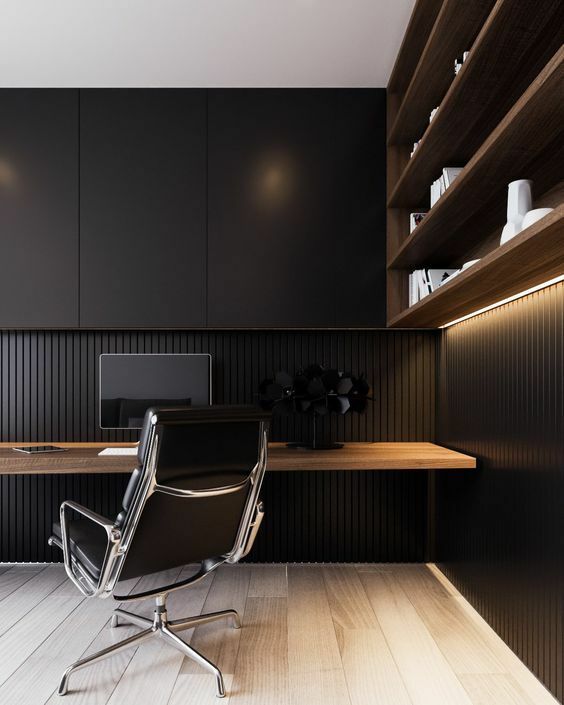 The subtle, yet impressive black accents in these interiors really complete the spaces. 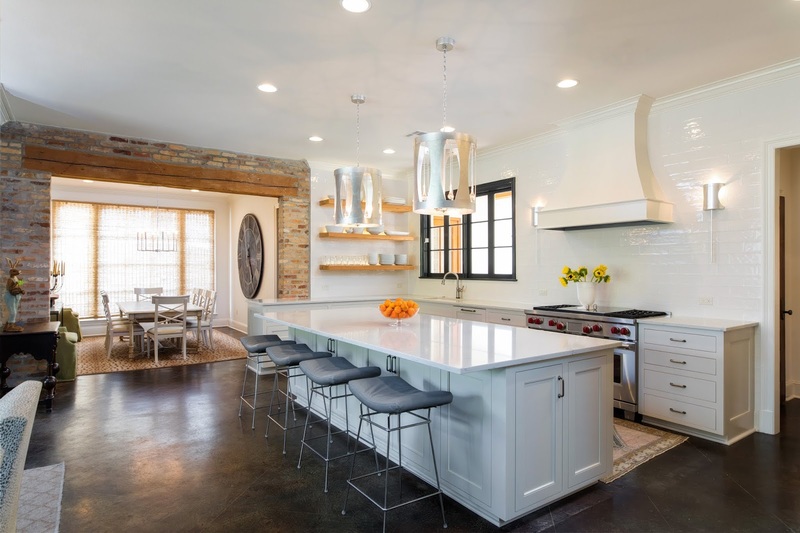 If you’re thinking about building a kitchen in a new home, or renovating a kitchen in an existing home, there is one question that is sure to come up: what countertops should you get? 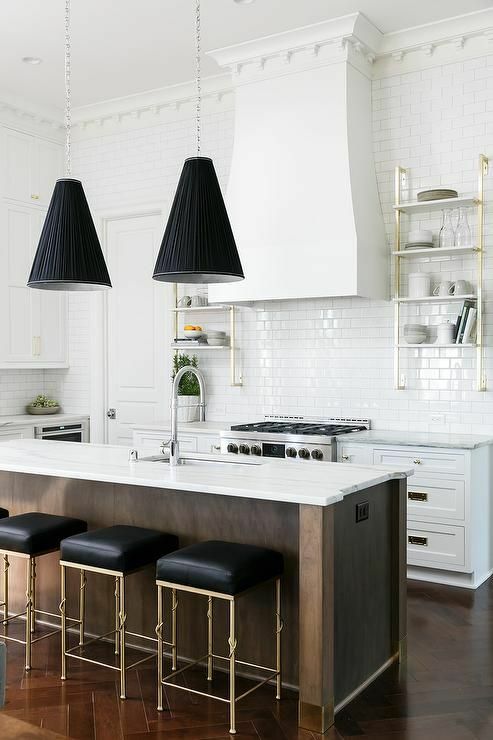 There are plenty of options out there, from tried-and-true marble to high-tech quartz, each type with its own pros and cons. If you don’t want to sweat the small stuff (and who does? ), it’s best to compare all three before making a decision. 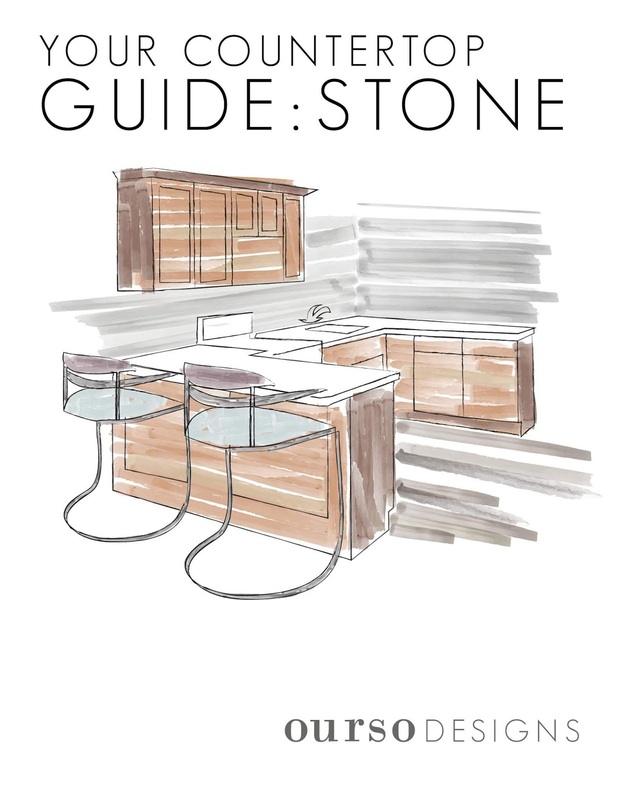 Here’s a breakdown of the three most popular stone countertop materials. What are Quartz, Marble, and Granite? Quartz, marble, and granite are all stone materials that are often used to make kitchen countertops. 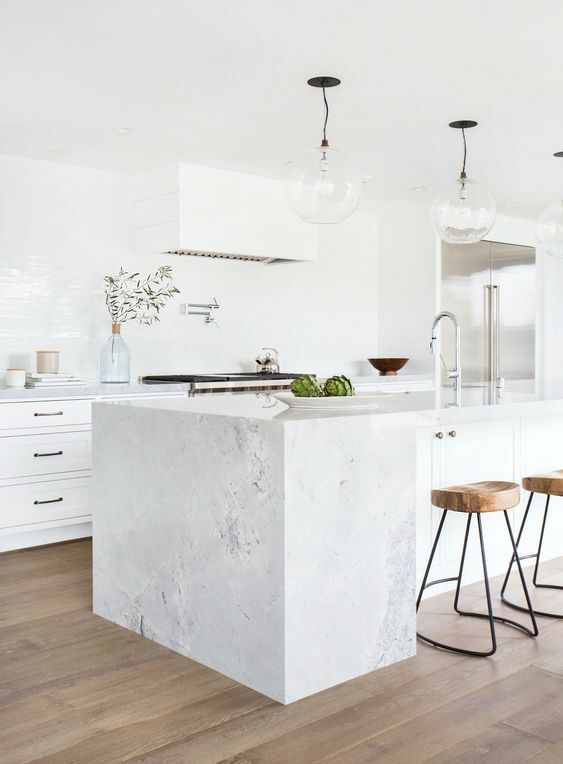 Marble and granite are natural stone – these are mined from a quarry, where huge pieces of stone are cut into manageable slabs, which are then further cut to fit on your kitchen countertop. Marble and granite both have beautiful, natural patterns that are unique to each piece. These marble countertops are unlike any other. These lovely quartz countertops were the centerpiece in a recent renovation. Quartz, marble, and granite are all extremely durable materials. There’s a reason stone is so often used to construct monuments and statues! They’re also all heat-resistant, which makes them great for baking. 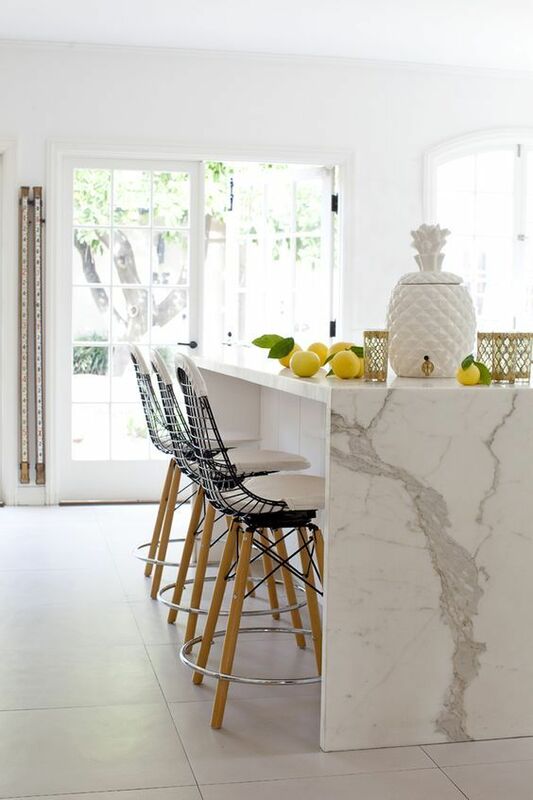 These marble countertops are beautiful AND perfect for breadmaking! Marble is, by far, the softest of all three materials, which means that it can be scratched or chipped the most easily. Granite is the much harder than marble, but it doesn’t hold a candle to the durability and scratch-resistance of quartz. Quartz’ added resin makes it extremely hard to scratch or nick. 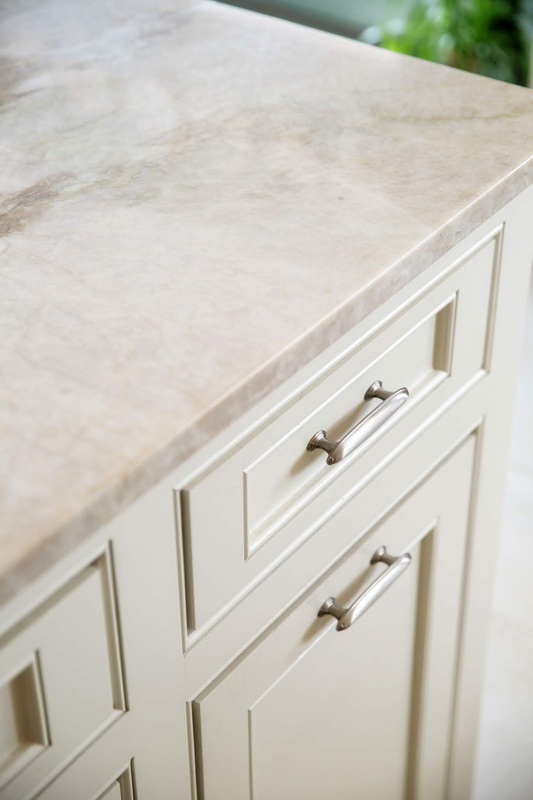 To some, an engineered product like quartz is a plus – the added processes involved in creating the stone in turn makes it more durable than natural stone. But, to others, “natural” can be a sticking point. Ask yourself if you would choose laminate floors over hardwood floors. If the answer is no, marble or quartz might be the better option. 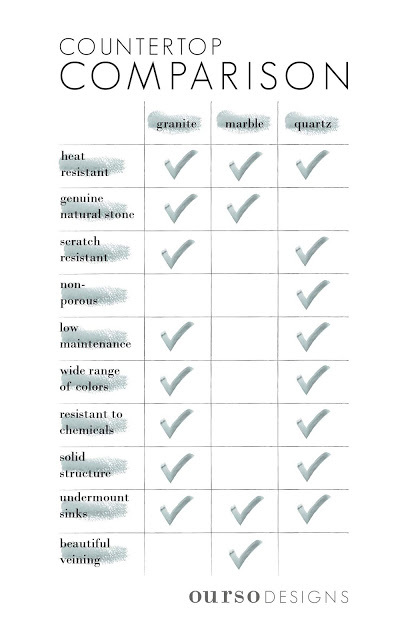 Granite and marble are both porous materials. This means that spilled liquids can potentially seep into the countertops, causing stains. Marble countertops are especially susceptible to stains from acidic liquids, like orange juice, coffee, or wine. Their porous nature also makes these stones more difficult to clean, which can lead to harmful bacteria and germs staying on your counters long after you want them to. Engineered quartz, though, is not porous. It is extremely difficult to stain, and bacteria have a much more difficult time adhering to the material’s smooth surface. If you’re set on having granite or marble in your kitchen, prepare for the maintenance. Both stones need to be sealed at installation, which helps prevent stains, and about once every year for the life of the countertops. They also need to be cleaned regularly with soap and water. Beware chemical cleaning products – some can cause stains. 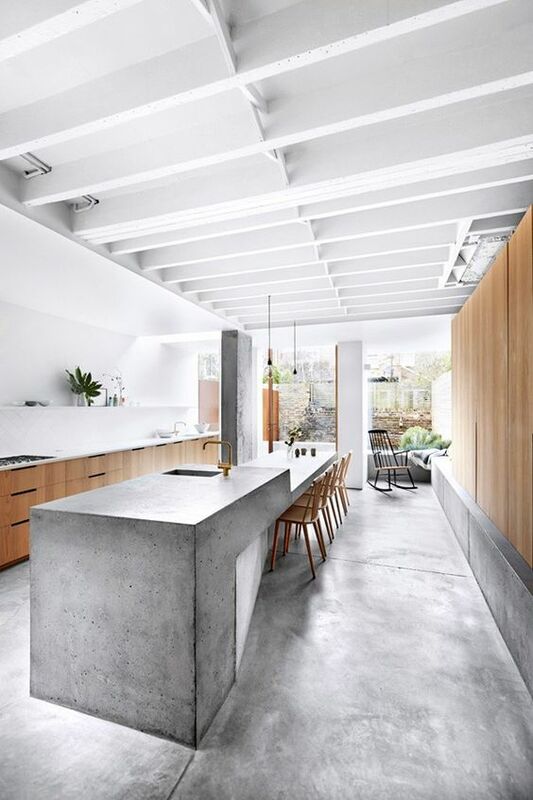 These quartz countertops lend natural elegance to this modern kitchen. Because quartz isn’t porous, it doesn’t need nearly as much maintenance. Most quartz blends can be safely cleaned with most household cleaning products. Because marble and granite are natural stone, mined from deposits around the world, every slab is unique. You’ll never have to worry about walking into a friend’s kitchen and seeing the same countertops on their island. 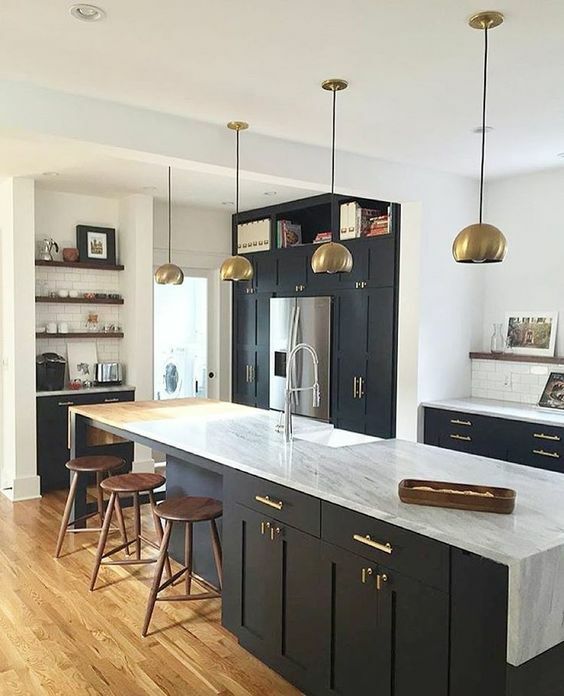 These black granite countertops give this kitchen a very modern feel. Quartz, on the other hand, is engineered. Although most manufacturers work hard to have a great deal of variety in quartz slabs, inevitably, some slabs will look similar. Quartz also doesn’t have quite the “natural” look that granite or marble has. While every granite and marble slab is unique, they often have a similar feel because they’re formed in a certain way and mined from only a few places in the world. And while there are many different colors and types of granite and marble available, the variety isn’t endless. Quartz, on the other hand, can be mixed with a huge variety of pigments, giving you an endless selection of colors, hues, and vein patterns. Costs for stone materials can vary wildly from place to place and can even vary based on the time of year. However, if you want quality counters, do not cut corners. 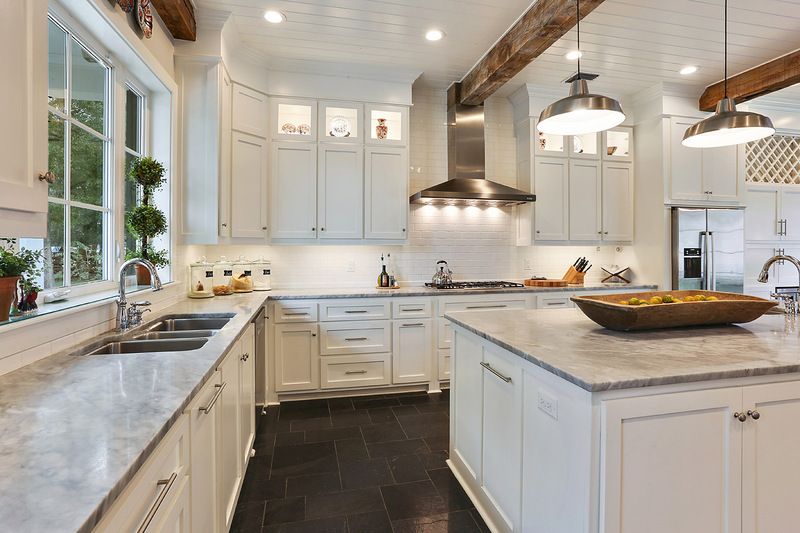 Stone countertops aren’t inexpensive, but they are worth the investment. On the low end of the spectrum is granite. 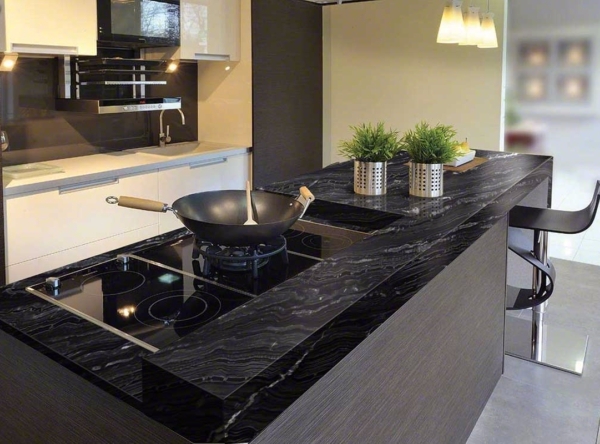 Where the granite is sourced from, or highly-prized patterns or colors, will make this stone a little more expensive. Quartz tends to be in the middle, price wise. For quartz, part of the cost comes down to the manufacturing process. Adding unique colors or asking for specialty veining can drive the price up even more. But, the king of stone countertop materials is marble. Marble has long been prized for its beauty, enhanced by the subtle veining. 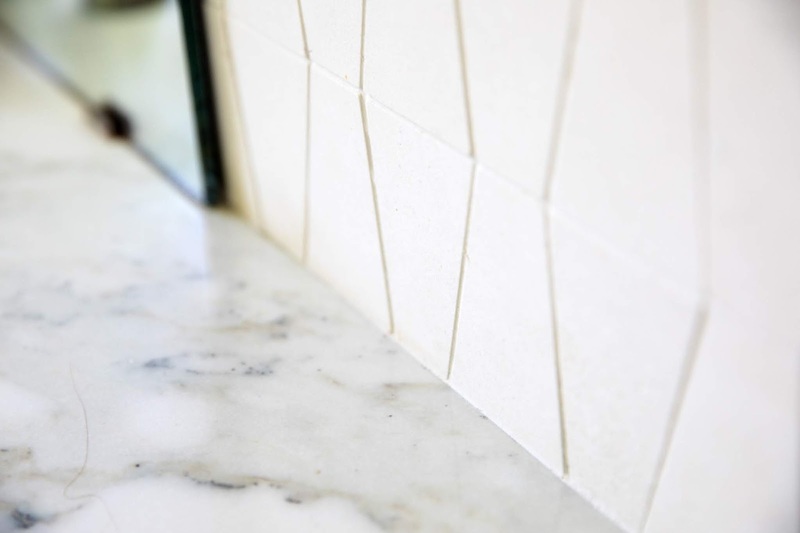 Marble is mined at several places around the world, but Italian marble, particularly Carrara, is considered the finest. Expect to pay top dollar for marble pieces from Italy. So what’s the best material for your countertops? There’s no one stone countertop material that works for all clients. What your decision often comes down to is what material works best for your major concerns. In most markets, quartz is the most affordable option. Other perks of this engineered stone are its ease of maintenance and durability. But it simply does not have the natural beauty and high-end look that marble, or even granite, has. In the end, marble is marble, and if you’re set on the look of marble, there’s no substitute. It might be a bit more expensive, but if you’re set on marble and it matches your kitchen or bathroom, it’s worth it for your countertop. The floor at the GHBA Product Expo. This week has been a busy week for me and my team. 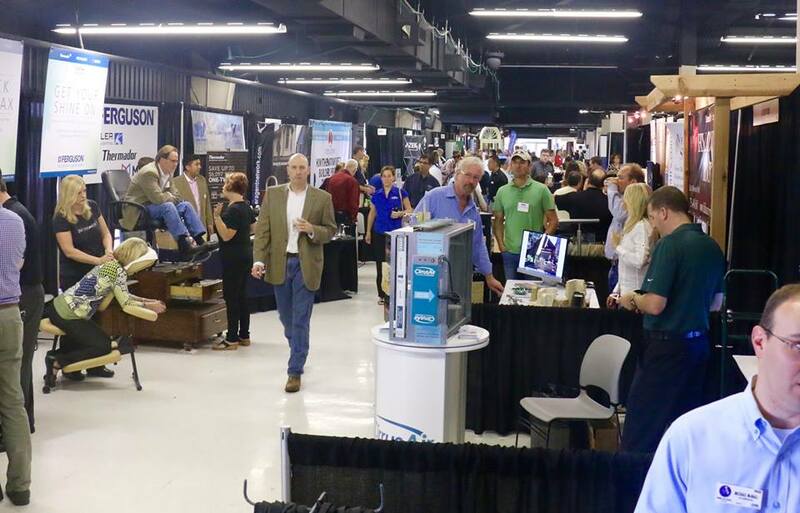 Yesterday, I attended the Greater Houston Builders Association Product Expo, where I met some really outstanding builders, contractors and designers. It was such a great experience for me and a great way to expand my network in Texas. I’m really looking forward to working with some of my new contacts on some future projects. Today, I’m on my way back to Louisiana! For this month’s post, I thought I’d take a moment to share my latest video. If you’re not familiar with the pieces that I make through my company, The Olde Mill, then this is a great introduction. If you are familiar, I’d appreciate it if you shared it with others in the industry who might be able to use a product like our engineered beams. The light weight of these beams makes them easy to install at any stage in the construction process. No room is complete without a good lamp. Even if you have floor-to-ceiling windows, that let in all of the natural light, your space needs a lamp. Give yourself some light once the sun has gone down AND add a little of your personality. With the huge range of lamps available, from companies all over the world, you can find the one that casts the right light and says something about you. 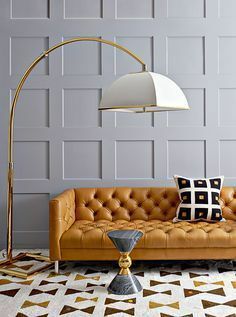 Floor lamps can be divided into three main types: arc lamps, stand lamps, and tripod lamps. Each type comes with its own pros and cons. Choose based on the needs, and style, you have in mind for your space. 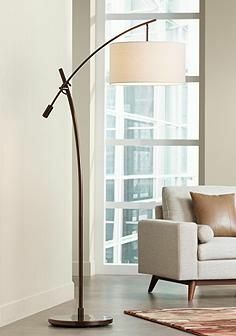 This is the most common type of floor lamp – a lamp that stands on it’s own, straight and proud. Because it is the most common, it comes in a range of styles, color, and finishes. 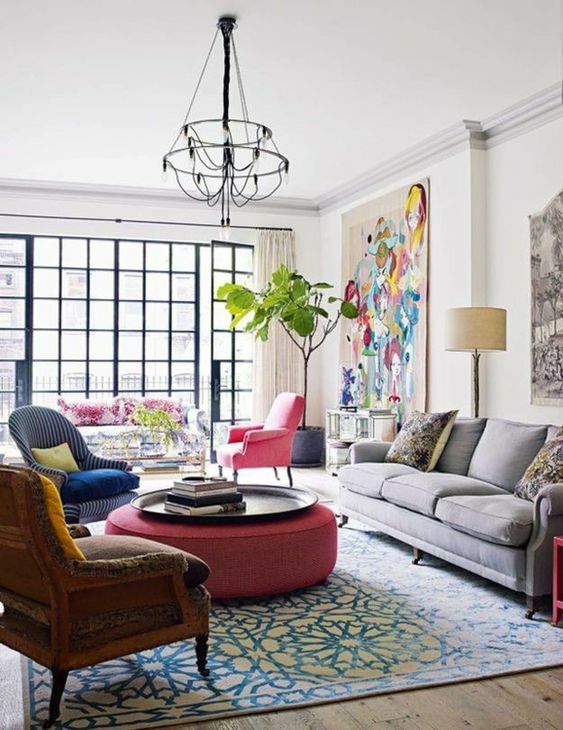 You can get interesting, and whimsical, pieces that have the ability to bring a lot of life to your space. Let your personality shine! This stand lamp gives off a clean, mid-century vibe. Source. 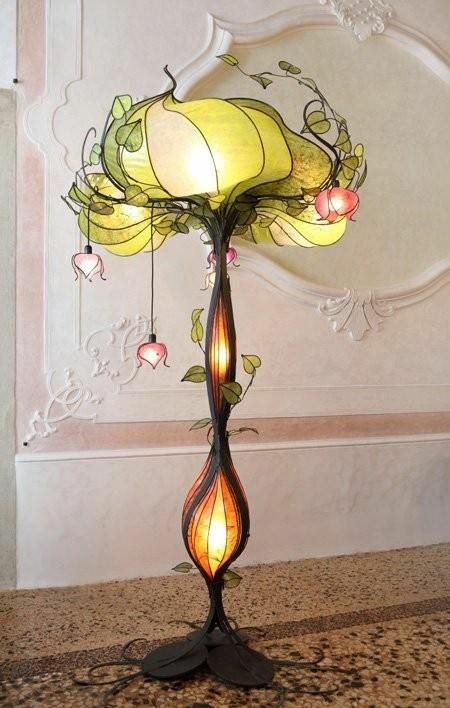 This gorgeous art nouveau stand lamp would be the star of any room. Source. Whimsical bird-perch stand lamp. Source. 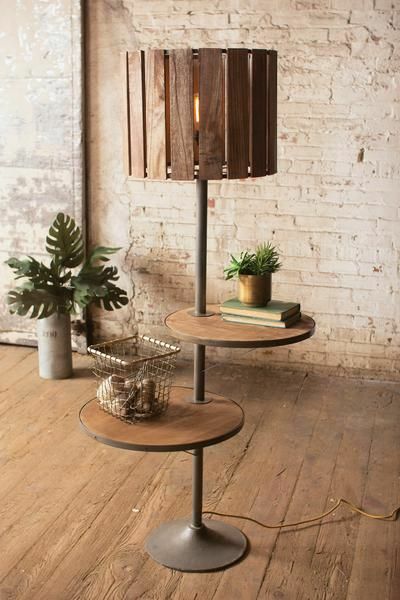 This stand lamp doubles as a table or shelving. Source. 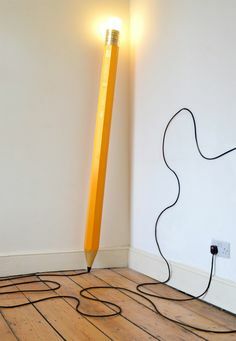 This pencil stand lamp would be a great accent in a children’s – or writer’s – room. Source. This stand lamp offers a little storage. Source. 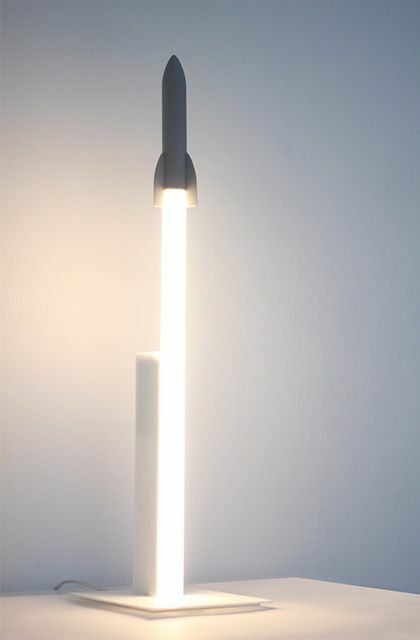 This rocket ship stand lamp is both modern and fun. Source. 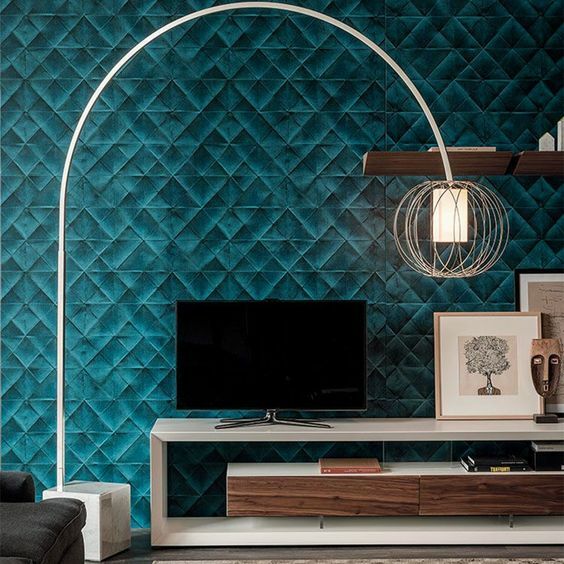 The fun lines of this stand lamp contrast the modern lines of the wall decor. Source. 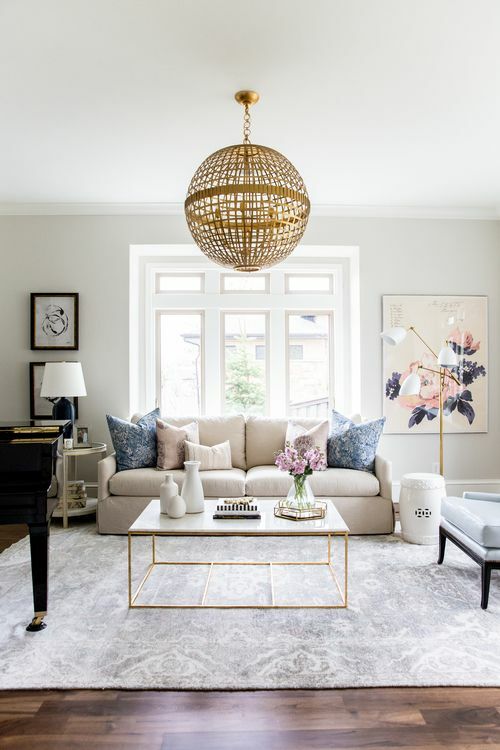 o wants the drama of a chandelier or hanging pendant but can’t make it work in the space. 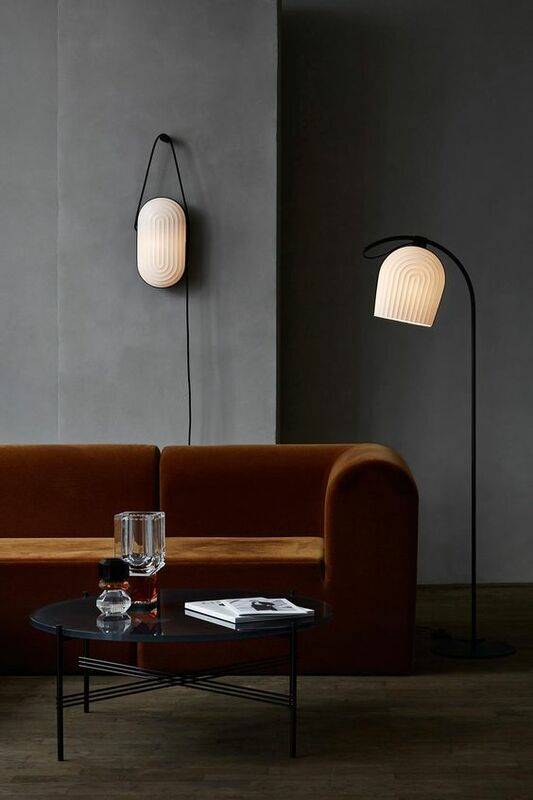 The curve of the lamp’s stand allows the light to hang. 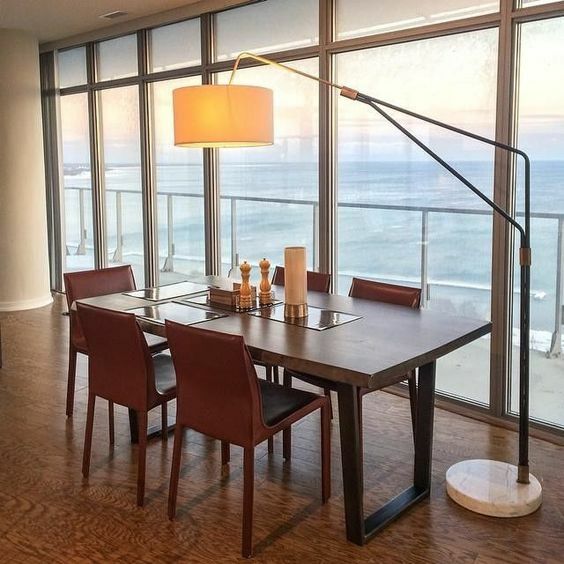 An arc lamp will also provide a little more direct light for people sitting on the sofa or at a dining table than a stand lamp – keep that in mind if you are an avid reader. Because these lamps take up more space than stand lamps, you need to think about furniture in the room. These lamps look big. 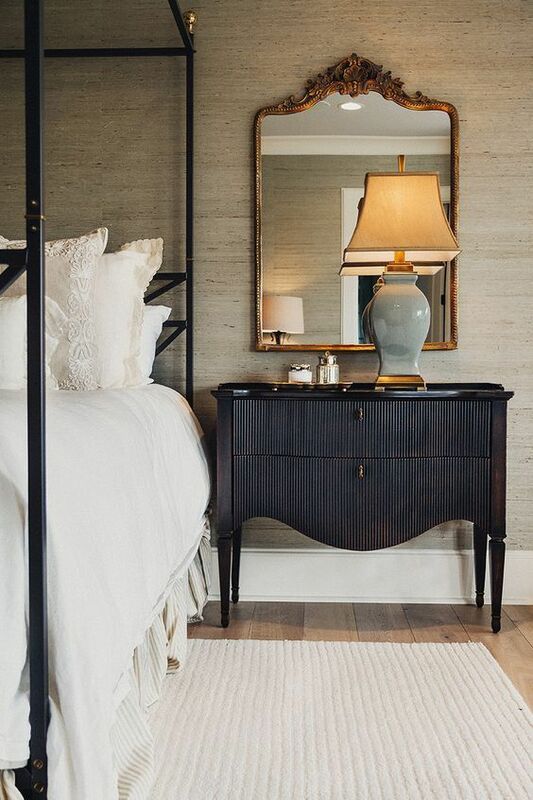 You want the ensure the lamp is proportional for the space and doesn’t overwhelm other furniture. 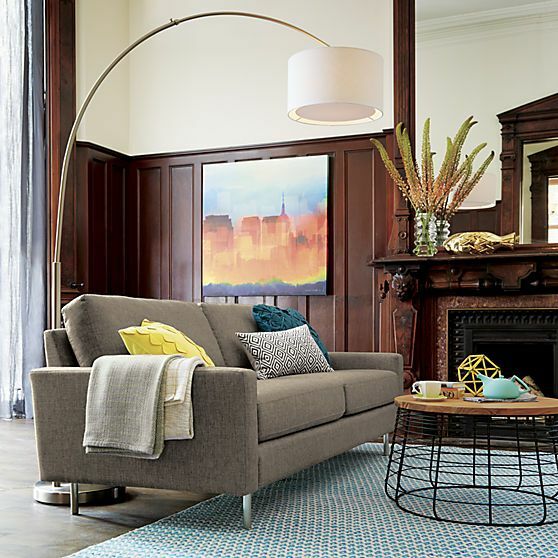 This arc lamp provides a great alternative to a hanging pendant lamp or chandelier. Source. The wire cafe of this arc lamp gives it an industrial feel. Source. 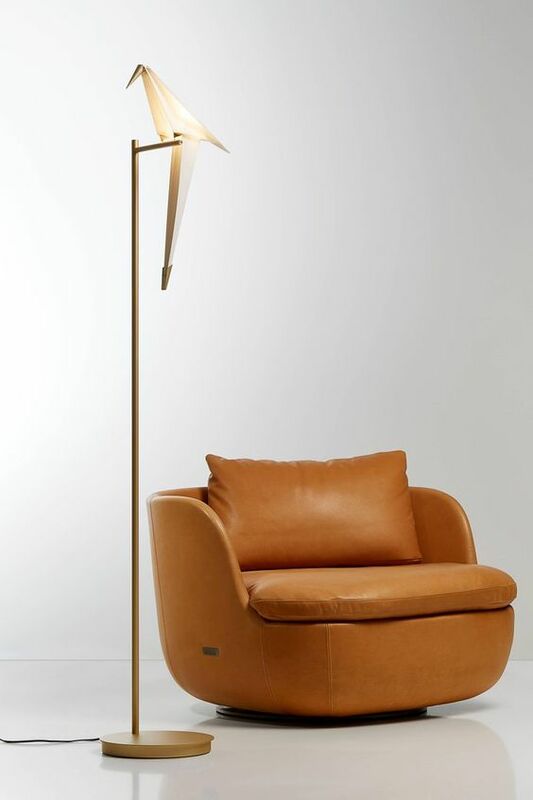 This arc lamp provides a little bit better reading light than your average floor lamp. Source. 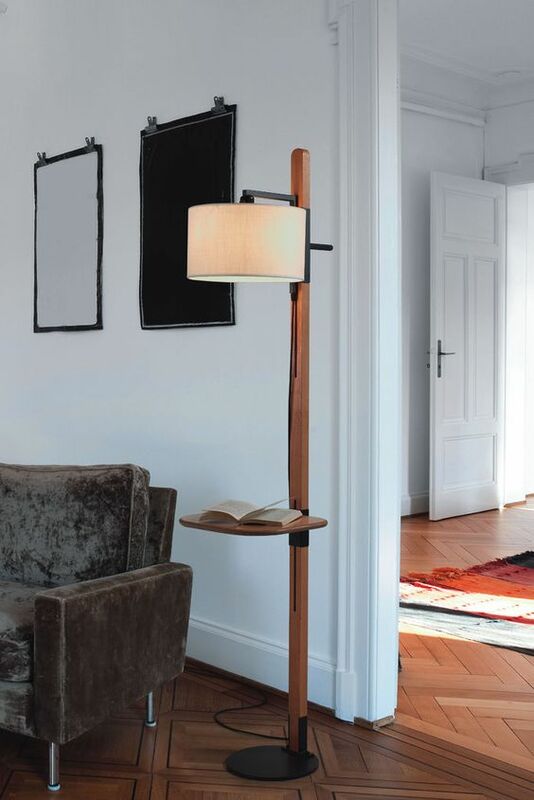 This arc lamp can be adjusted to fit the height of surrounding furniture. Source. 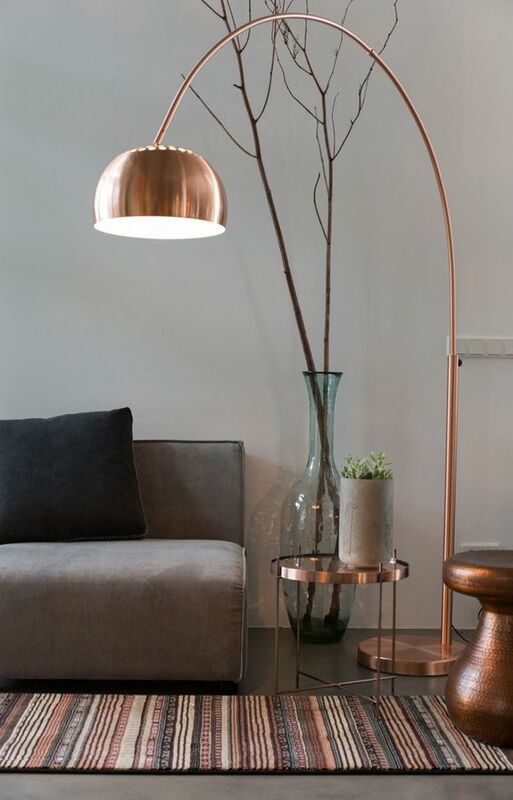 A rose gold arc lamp lends a very modern feel to this space. Source. 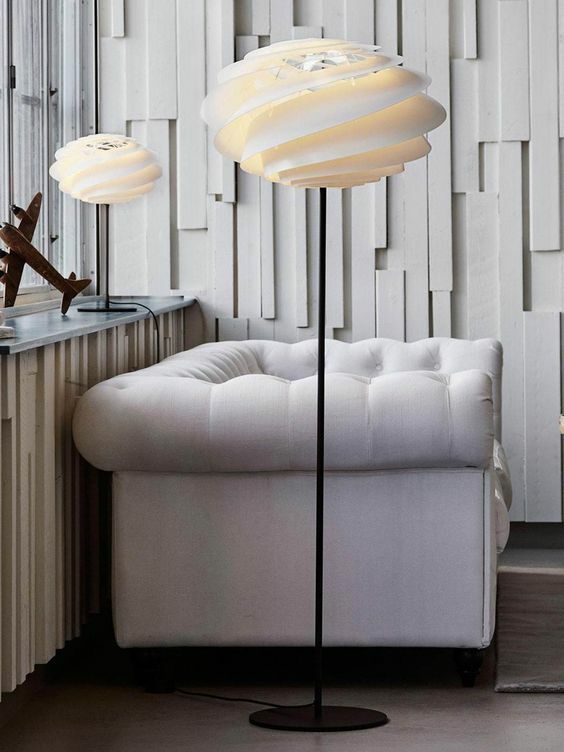 The paper shade of this arc lamp lends a soft light to this bright space. Source. 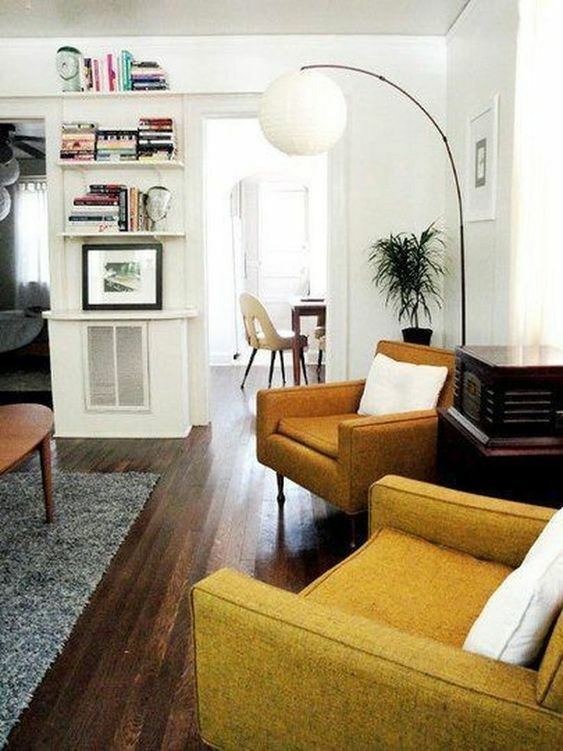 The added texture on this arc lamp’s light shade adds some interest to this clean space. Source. 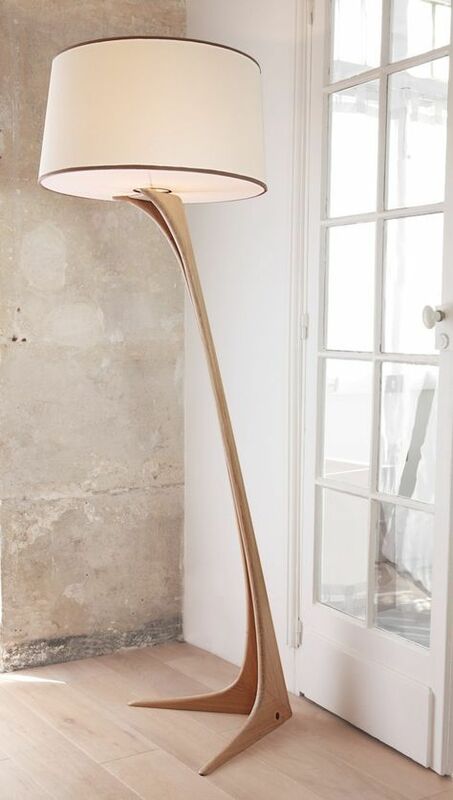 This arc lamp adds big visual interest. Source. mp with a more novel light source. These lamps work best in corners of rooms, or out of the way of foot traffic. You don’t want to trip over one of the lamp’s legs. 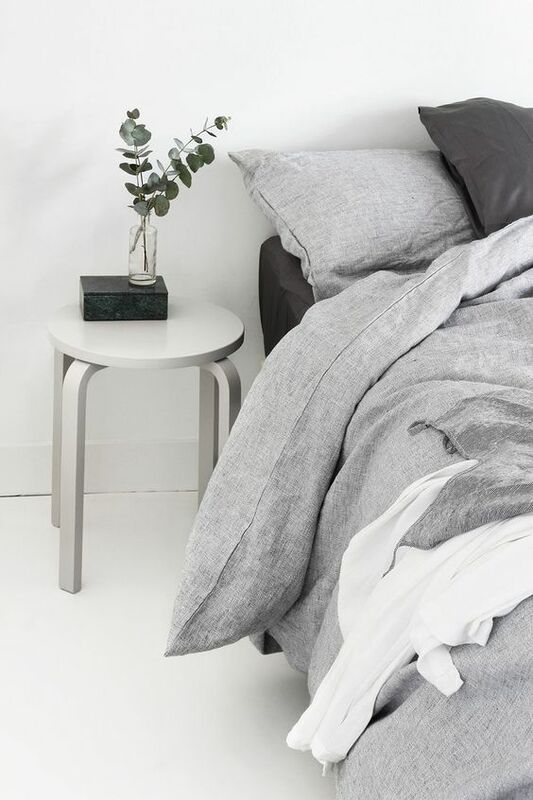 This tripod lamp draws the eye when displayed against the space’s monochromatic palette. Source. This tripod lamp makes clever use of a vintage Cadillac head lamp. Source. 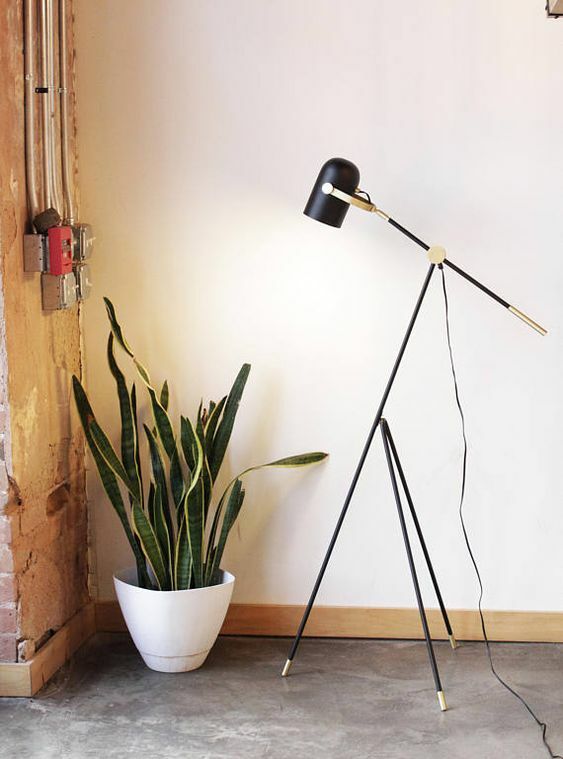 The added swing element of this tripod lamp makes it feel more industrial. Source. 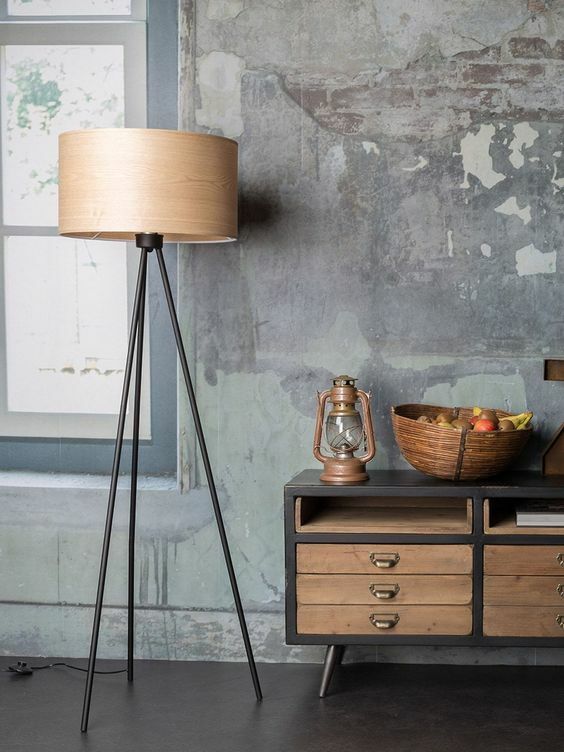 Reclaimed objects, like this vintage tripod lamp, work well with a rustic look. Source. With a globe shade, this tripod lamp casts light in every direction. Source. 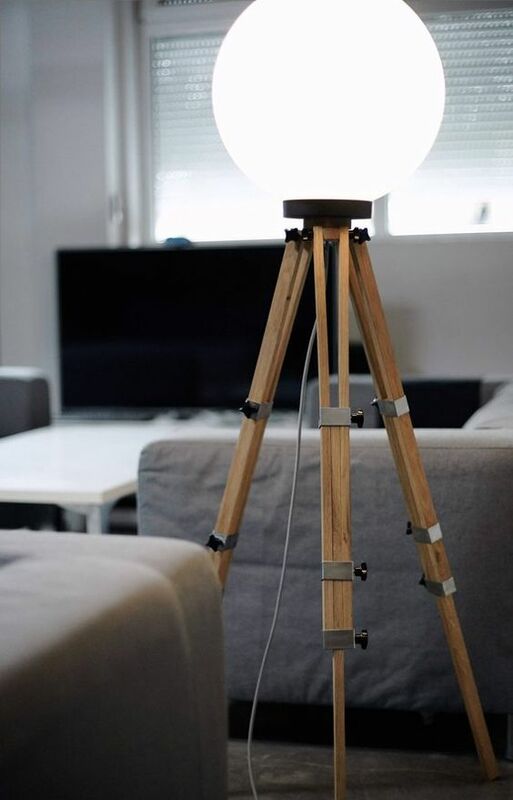 This simple tripod lamp complements the existing furniture. Source.